I’m starting a new series and am finding the circumstances and ideas swirling around are really interesting. I want to share some of that with you. I want to put this in some sort of framework to make it easier to understand. Let’s start with some generalities. I’ve identified 4 things that factor in to what I’m working on and how I tackle it. I’m not sure if this list is complete though. Previous work – Almost always there’s some connection to earlier work. It may be really obvious if it’s just the next piece in the series. It might be more subtle if it’s just a color combination from an earlier work or even a discarded idea from a failed painting. process of settling my mother’s estate, I started a series of farm paintings which combined family history with physical geography. My head was swirling the difficulties of clearing out the house and particularly the barn. The barn took on epic proportions in the earliest of these paintings. What’s going on around me – This is often connected to what I’ve been reading, what I’ve been discussing with friends, what I’ve been looking at. For example, when I first started doing the small collages on panels, I had seen a fabulous exhibit of collage at the Portland Museum of Art. Although I took copious notes, I think the new ideas simply came from seeing LOTS of possibilities and different approaches to collage. What I have available for resources – Sometimes what I work on and how I work on it is connected to what I have for materials & resources. For example, I first began doing landscape collages during a time in my life when I only had short periods of time for art. I couldn’t do big wet & juicy watercolors when I had only 15 or 20 minutes to spend in the studio. My art practice reflected these limitations. This is just a general introduction to where my ideas come from. In the next post, I’ll discuss these factors in relation to my new series. Although my work sometimes looks like it’s all about color, that’s only part of the story. Fundamentally, it’s about landscape, abstraction, emotion, and memory. A little background – As a child, I loved the little details of the landscape – patterns made by the lengthening shadows in the woods, the ripples on a pond, or the intricate swirls made when water freezes in a brook or puddle. Long before I knew anything about art, I was viewing the world in terms of pattern, movement and simple intimate compositions. I was noticing abstract design elements, not just objects. I had landed upon a way of looking at the world that would stay with me and inform my work years later. As my work moved further away from realism, my use of color became stronger and bolder. I developed a passion for intense colors, colors that still bring me joy; colors that still make me feel good. Why landscape? I believe we are more connected to land and place than we realize. We carry with us the memory of places we have known intimately, places where we felt safe, places where we felt joy or peace, all those special places that continue to elicit an emotional response many years later. 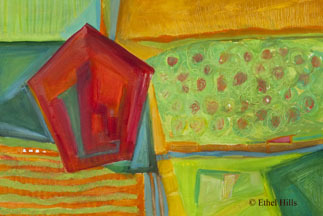 This connection between landscape, emotion, and memory is the basis for my paintings. The small-scale mixed media paintings that I now create reflect my passion for color, my semi-abstract take on the world, and my use of landscape imagery. These elements contribute to my goal of producing paintings that remind the viewer of their own connections, their own memories, their own special places. Can you see beneath the color on these pieces? What do these paintings make you think of? Do they evoke any memories for you? Do any of these just make you smile?